This past week has been Tech Week for the production of Oliver! in which I was performing, which left no time at all for the blog. The photograph is of me as Fagin, surrounded by my little thieves and pickpockets. I love doing shows with young actors, and I think you can see my enjoyment here. Yesterday was one of those days where all the news was good. 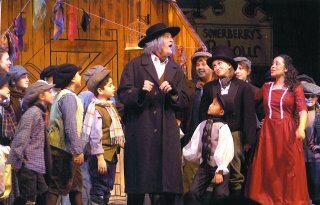 It was the closing performance of Oliver!, which turned out to be the best show of the run. In addition, my team won the Super Bowl (I've been a Steelers fan since before their first Super Bowl win in 1975), and Seton Hall, my alma mater, beat Rutgers in basketball. To top it all off, I finally got gdb to cross-compile for the GP2X. I am now dreading the inevitable bad day that I expect will soon arrive to bring balance to the Force.